If you’re planning to buy one of the new iPhones Apple just announced, you should know something by now: It will have a notch. It’s tough to swallow, I know, but when Apple based all its new phones on the iPhone X, it was always going to show up and take a squircle-shaped bite out of the top of your display to make room for Face ID. Whether you like it or not, notches are part of your life now. Forever, probably! But as one hawk-eyed Twitter user pointed out yesterday, if you look at the wallpaper Apple picked out for its three new devices, you may notice something interesting. Ask yourself this: On the Compare iPhone Models page, on Apple’s official website, which one of these nice new phones do you think has a notch? Well they all do, of course. We’re not going to waste your time or ours playing dumb here. Let’s cut right to the chase: How come we can only see the notch on Apple’s cheapest new phone, the iPhone XR? If you recall last year’s ads for the iPhone X, the notch was the star. All the new tech in it helped convinced actual humans, including yours truly, to spend upwards of $1,000 on a smartphone. On billboards, the amorphous wallpaper Apple chose swirled around the notch in loud hues of red, blue, orange, green, and yellow. You couldn’t ignore it—you wouldn’t dare—and you can’t ignore it still on the iPhone XR. But what about on the iPhone XS? Let’s take a step back for a moment. While it’s not so easy judging from this image alone, the notch is still of course present on all of the iPhones pictured above. We can even see a faint speaker cutout and the little front-facing selfie camera upon closer inspection. As we’ve previously established earlier in this piece, it is still there, on the iPhone XS and XS Max. But why is it hidden on a page where Apple is attempting to make it easier to compare its expanding smartphone line? 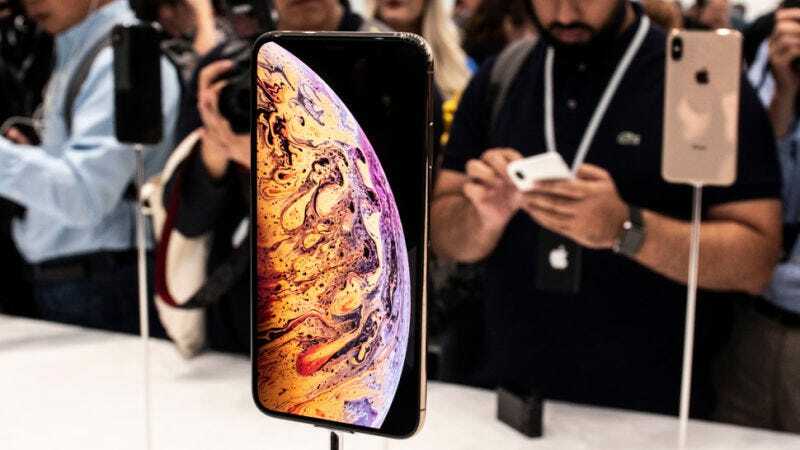 You might argue it’s because Apple is working hard to sell its fancy OLED display, which is capable of blurring the line between bezel and screen, but is only available on Apple’s XS and XS Max. More sinisterly, you could accuse Apple of deliberately making its cheaper phone look worse. But why then would Apple want for any of its new phones to look worse? Maybe still Apple is simply being sheepish about the notch. Has it grown ashamed of it? And what other options do we have—could Apple have merely done this by accident, inadvertently leading us to waste an inordinate amount of time on absolutely nothing? No, Apple doesn’t do anything by accident. So why can’t we see the notch? It’s because on the wallpaper the background there is black.